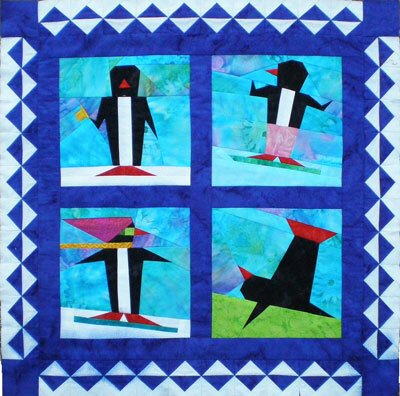 This is my tale of woe for my sad little penguin quilt. It started innocently enough. It was a little wall hanging paper piecing pattern I'd found in the now defunct "The Foundation Piecer, The Pattern Journal for Quilters Who Love Paper Piecing". It was July and that meant hot here in Illinois. I needed something cool and refreshing. This little pattern was like falling into a tall, ice-cold glass of lemonade. So I gathered my fabrics and got straight to piecing. Nope, not this time. This baby was never, ever going to be washed, so why bother? This was strange for me, because I always prewash. But my bee-mates didn't. Live a little, I thought, and took a walk on the wild side, skipping my usual step. This is my poor little quilt top. Now, I'd found just the perfect little white-on-white fabric for the snow and this absolutely brilliant royal blue batik for contrast. Itty-bitty paper pieced border! Now that took a bit of time to do, but it was done and I was on the final pressing before layering my quilt sandwich. Now I don't know about you, but I quilt with gusto! The top was on the ironing board...my cold iron, too. I knocked that iron over and its cold water went splishy-splashy everywhere...including my poor little quilt top. 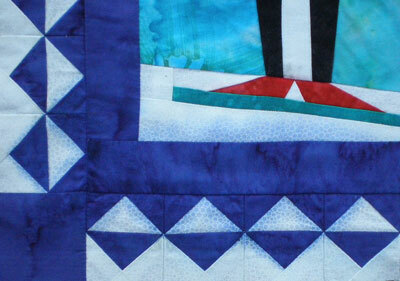 That captivatingly blue batik, the only one just perfect for this silly little quilt, had bled all over the white snow fabric. Wash it I did. Hand wash...machine wash...many times...dye magnet...OxyClean...and everything else I could think of. But I was never able to get all the blue out. And the poor little quilt has never been finished. Even if you don't prewash, pretest your fabric for quilts you care about. I've had this page written for awhile, but wanted to find this top for a photo. Just knew I'd tucked it somewhere. And I found it...tucked in a group of other finished, but as yet, unquilted tops. I thought I'd pretty it up a bit before photographing...spritzed it with a bit of water to iron, because, hey, I have done everything to remove the bleeding blue color. This sad little penguin quilt top has bled again! Have you had a fabric bleed in a quilt? Was it before or after it was finished? Were you able to save it? Share your story with quilters who know just how it feels. That gut-wrenching sick feeling in the pit of your stomach when you see it for the first time. Did you find a remedy that worked? Please share that, too! If you can bear to, share a picture with us. Do you have a picture to share with us? Great! Click the button and find it on your computer. Then select it.